You Are Here: Home > Download the 5 Questions to Ask Before Buying a Used Car eBook Today! Download the 5 Questions to Ask Before Buying a Used Car eBook Today! Looking for a used car near Annapolis, Highland Beach, and Hillsmere Shores is an exciting process. With so many body styles, colors, and features to choose from, you’ll have fun picking that perfect model. You’ll want to have this car for a long time, so you want to make sure it’s perfect. 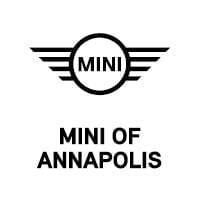 Our team at MINI of Annapolis will help you out with our detailed eBook, 5 Questions to Ask Before Buying a Used Car. After reading through this eBook, you’ll be one step closer to getting the used car of your dreams. Not only that, but you’ll get a money-saving offer that you can use at our dealership. 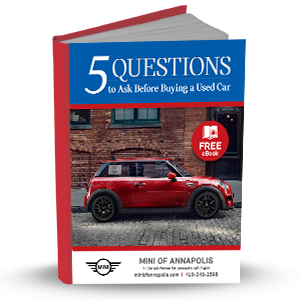 So, before you drive home in that new-to-you car, download your FREE copy of the 5 Questions to Ask Before Buying a Used Car eBook today!